into bite-sized pieces (1 inch x 2 ½ inches). 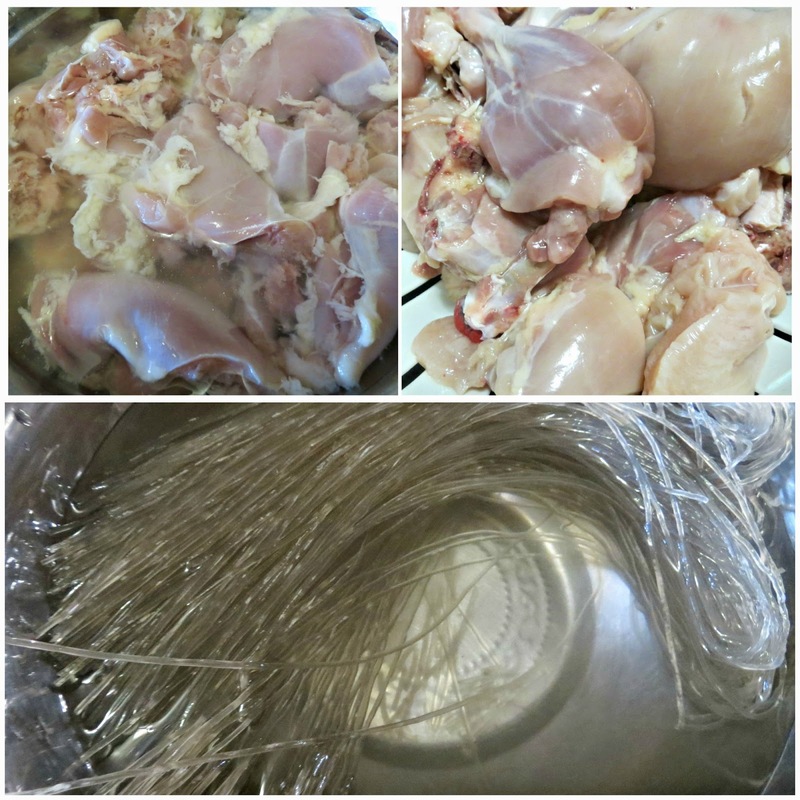 *Rinse the chicken in cold water and soak it for a few minutes. Drain and set aside. *Soak 100 grams (3.5 ounces) of starch noodles in cold water. 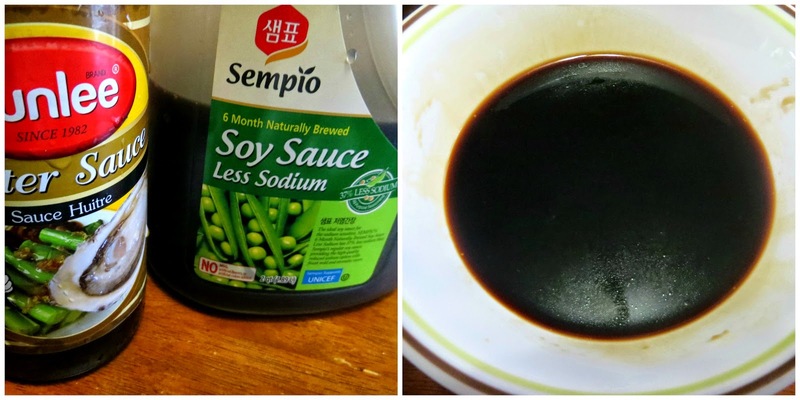 Combine ¼ cup soy sauce, ¼ cup oyster sauce, ¼ cup rice syrup (or corn syrup), and 1 tbsp dark brown sugar in a bowl. Set aside. 1. Cut 3 peeled medium sized potatoes into 1½ inch thick chunks. 2. Slice 1 medium sized carrot into slices 1/8 inch thick. 3. Slice 1 medium sized onion. 4. Chop up 1 red chili pepper and 2 green chili peppers. 5. Slice 1 cup’s worth of white mushrooms into bite-sized chunks. 6. Cut 5-7 green onion stalks into pieces 2 inch long. 7. Shred the white parts of the green onions thinly lengthwise, and soak in cold water for 10 minutes before draining. 1. Heat up a wok or a shallow skillet. Add 1-2 tbsp vegetable oil. 2. Cut 2-3 dried red peppers into pieces ½ inch long. Add them to the heated oil and stir-fry for 10-15 seconds before taking them out. 4. 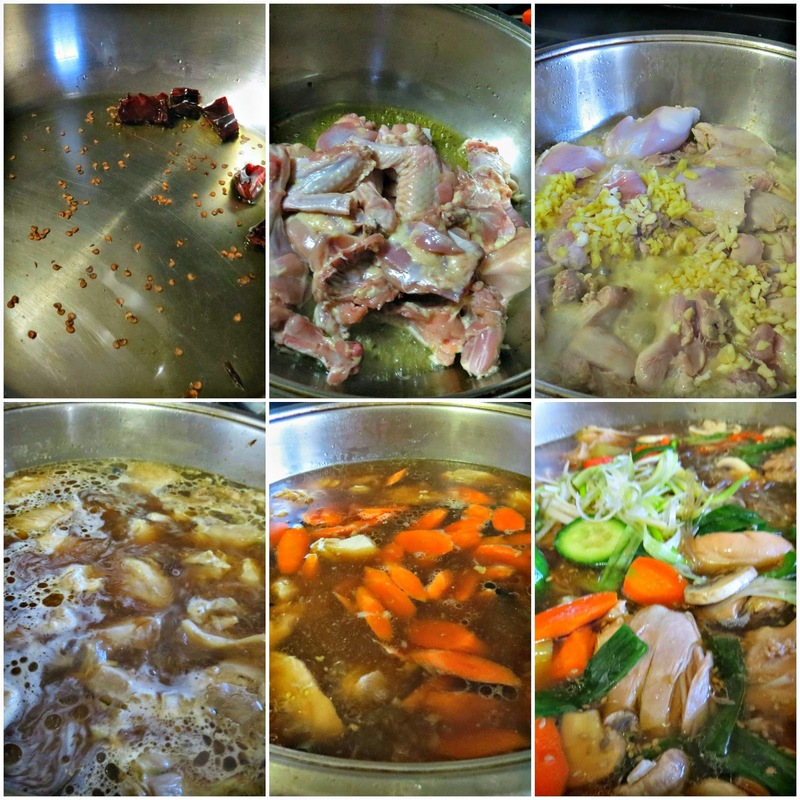 Stir the chicken with a wooden spoon a few times. Let it cook with the lid open for about 3-5 minutes. 5. Turn the chicken over, give it a quick stir, and let it cook with the lid open for another 3-5 minutes. 6. Add minced garlic and ginger and stir it for a minute. 7. Add the potato chunks, the sauce, and 2½-3 cups of water. Cook for 10 minutes over high heat with the lid closed. 8. Open the lid and add carrot and onion and continue cooking for another 10 minutes. Keep the lid open. 10. Transfer to a serving plate and garnish with chopped green onions and sprinkle some sesame seeds over top before serving. This is my first attempt where I used young chicken and I didn’t have sesame seeds but it was well compensated by the toasted sesame oil I added upon serving. And this is the more recent one using organic chicken which yielded a more flavorful result although the first was not lacking in taste and was well received. I added more ginger and a little more broth because the noodles absorb the liquid quickly especially if not eaten right away. I would advise to reserve some broth when the stew becomes too thick. I’m really pleased with the results on both and I’m glad I made it and discovered another tasty Korean dish. The success depends on fresh ingredients and the right amount of spices.